Becoming a non-smoker with hypnotherapy and mindfulness usually takes less than 2 hours. Regardless of the length of time that you have smoked, hypnotherapy and mindfulness can help you stop and look forward to a healthier life. 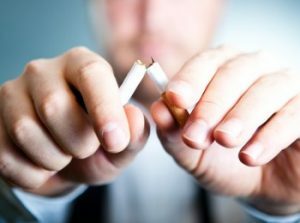 As well as helping you break the habits of smoking, you will learn various techniques to help you stay a non-smoker. I will support you in making it as easy as possible as long as you are fully committed to stopping. Within 8 hours carbon monoxide levels in your blood are greatly reduced and oxygen levels in your blood return to normal. Within 24 hours, carbon monoxide levels in the blood begin returning to normal and your lungs start to clear out the residue of tar. Within 48 hours, your taste buds and sense of smell improve. Within 72 hours your breathing gets easier and energy increases. Within 12 weeks your circulation improves making it easier to walk and run. Long term mental health benefits are numerous. Breaking habits and taking back control can boost your self-esteem and confidence. Beating the addiction can empower you to create new positive thoughts, behaviours and feelings to lead a more healthy life. The new skills that you have learnt will empower you to break other bad habits and create new neural pathways. I look forward to working with you soon to help you enjoy a life free from smoking. Your 2 hour appointment includes hand outs, MP3s and meditation cards. You will be more than ready to enjoy your new smoke free life! Your investment is £195 so call Ceinwen today on 07842 129412 or email: ceinwen@hypnotherapy4solihull.co.uk.